Friends of Hungary, the organization that claims to be non-partisan, has been given its marching orders by Prime Minister Viktor Orbán. The authoritarian Hungarian leader’s speech on Saturday, at a conference organized by the Friends of Hungary Foundation, was at least as inflammatory as that which he gave last summer in Transylvania on the value of illiberalism, and which made headlines throughout the world. A few weeks ago, I mentioned the Friends of Hungary Foundation in one of my articles, which resulted in a response from the organization’s director, Szabolcs Nótin, who also edits the group’s online paper, Hungary Today. (Earlier, Éva Balogh’s piece in Hungarian Spectrum, on the same organization, led to a tirade from the foundation.) Curiously, in Hungary Today’s coverage of Mr. Orbán’s talk, there is not a single mention of the prime minister’s comments on democracy, authoritarian rule and civil liberty, yet for Mandiner.hu–a conservative news site–this aspect proved to be the most striking part of the speech. The Mandiner article, entitled “Non-democratic countries are successful” focuses on the fact that “according to the prime minister, non-democratic regimes are much more successful, and any energy that can be felt in the international system is all thanks to autocratic countries. “There is an intellectual debate within the European Union, in which the prime minister is on the right side, even though these views are less popular. He thinks that the further expansion of civil liberties is not a good idea and he added that ‘we’ must reject Europe’s progressive direction,” writes Mandiner about Mr. Orbán’s speech. I should note that Mandiner has always been a more moderate (basically libertarian) conservative voice, even though its editors were all associated with Fidelitas, or with Fidesz in previous years. In recent months, however, its criticism of the Orbán government has become much more forceful. This might have something to do with a change in ownership around the site’s publisher. HVG uploaded a video of Mr. Orbán’s speech, as well as a brief article, and this too emphasizes the fact that the Hungarian prime minister believes that authoritarian regimes are proactive, while democratic ones are merely reactive. 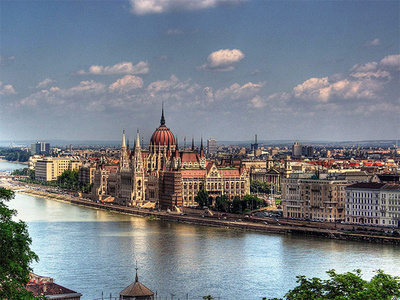 Mr. Orbán added that despite any “fumbling” on the part of the Fidesz government in Budapest, at least Hungary is not “adrift” like Europe seems to be, in his view. He suggested that the 28 members of the European Union have ceded (or, more precisely, pooled) too much of their sovereignty, and that some jurisdictions should be reclaimed by national governments. Mr. Orbán also believes that “progressive” Europeans see civil liberty as being able to question gender/sexual identities, national identities and “God’s creation.” Not surprisingly, Mr. Orbán finds all of this questioning totally unacceptable. “It’s better for us to honestly declare, that we don’t agree with this. There is no compromise,” added Mr. Orbán. This is where Mr. Orbán received a huge ovation from the Friends of Hungary crowd. Presumably, they are all deeply concerned by how the liberal West is forcing people to question their personal gender identities. “While Europe is debating, the East is at work. On our continent, debates are regarded more highly than labour,” said Mr. Orbán in his speech to the Friends of Hungary, building up yet again a false dichotomy between the “productive” east and the liberal western democracies that do nothing, but sit around and talk about ideas. Of course, we all know that Mr. Orbán has no respect for debate and dialogue, or opposing viewpoints. He has managed to run in two parliamentary elections without entering into a single debate with his political opponents. I can also count on five fingers how many times he has given interviews to any journalists who are not accomplished Fidesz party hacks through-and-through, over the past five years since his return to power. But since Mr. Orbán puts such a premium on work, the 150 members of the Friends of Hungary Foundation who attended this conference, and many of whom are active in diaspora communities, have been given their assignment, which is effectively to help quash any debate about the Orbán government in Hungarian communities abroad. “In 2014, Hungarian voters ended the era of unproductive debates,” said Mr. Orbán According to the Friends of Hungary, their goal is to “provide Hungarians living around the world with unbiased information on the country and popularise Hungarians’ successes in the field of culture, business and science.” Mr. Orbán’s speech at their conference was one example of the unbiased information that the Foundation provides to diaspora communities. Hungary's prime minster says that Asia represents an increasing challenge to the West and that while Europe, shocked by the January terror attacks in Paris, wastes time on ideological debates, the East works. Prime Minister Viktor Orban, who last year came under widespread criticism for saying he wanted to build an "illiberal state," said in a speech published Monday on the government web site that it sometimes seemed that in Europe there was "greater honour for debate than for work." Orban, who spoke Saturday to the Friends of Hungary Foundation, said Europe was trapped by "magic words" like multiculturalism and political correctness and weakened in the face of pressing issues like immigration. Hungary has recently seen a steep rise in the number of arriving migrants and refugees. Hungary wants to reintroduce the death penalty. It may seem a surprising move for an EU member state but that’s exactly what Hungarian Prime Minister Viktor Orban wants to do even though capital punishment is not permitted under EU rules. Many politicians say any member state that wants capital punishment should leave the EU. The European Parliament’s Committee of Civil Liberties says reintroducing the death penalty would be a clear violation of EU law. “Viktor Orban doesn’t defend anything.” said Louis Michel, MP of the Alliance of Liberals and Democrats for Europe. “He is destroying everything. By launching a debate on the death penalty, he is turning Hungary against the flow of history. That is the truth. Death penalty never reaches its goal. It is not right for justice to commit a crime.” Many people say Orban is trying to prevent his popularity from plummeting after support for radical nationalist Jobbik party soared.